We have recently carried out this project (entitled “How does a reggae sound-system work ?”) an despatched it to São Polo, Brazil. This wooden panel especially requested for “Jamaica Jamaica” exhibition in SP, and was expressly and exclusively made for that occasion. Originally written in English, it was then translated into Portuguese. 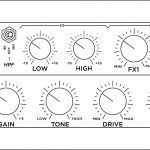 It features many sections representing some commonly used machines in the reggae/dub scene like : a Dub Siren, a Delay (Echo effect), an Active 4-way filter and a 10-Band Equalizer. 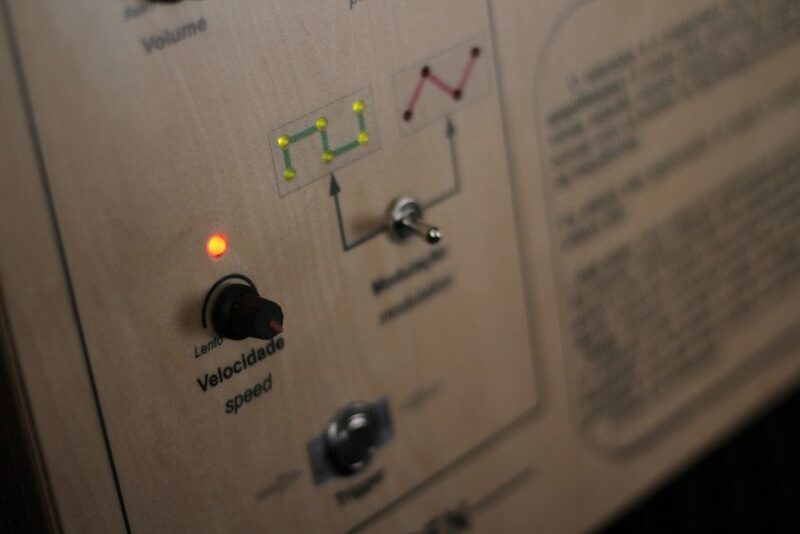 Overall view of the wooden electronic panel. 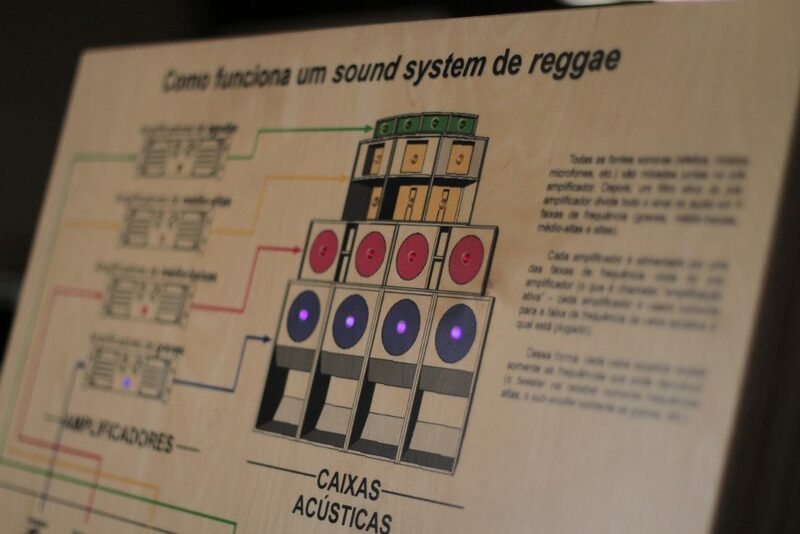 Every section has its own set of explanations to clarify how it does impact the sound and how it is usually used in the reggae/dub sound system context. 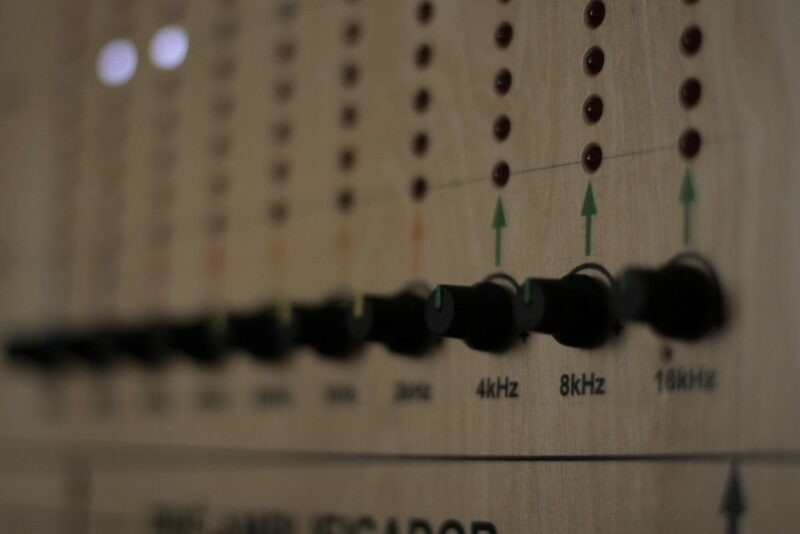 In addition to that, the music that goes into this panel is directly impacted by the analog circuits inside it, so the visitors can become actors and turn every knob to hear in real time how it does affect the sound. 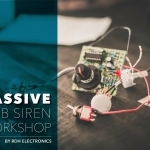 Lights are also dynamically switched on and off according to the change in the sound, thus this gives a real interactive approach which makes the understanding of electronic and sound concepts easier for most people. This project was a genuine and expressly custom made one : The team from Expomus in Brazil contacted us in early February 2018, they were very interested in the project but needed it to be ready for the end of February 2018, so that it could be despatched from Paris to Brazil with the rest of the exhibition. 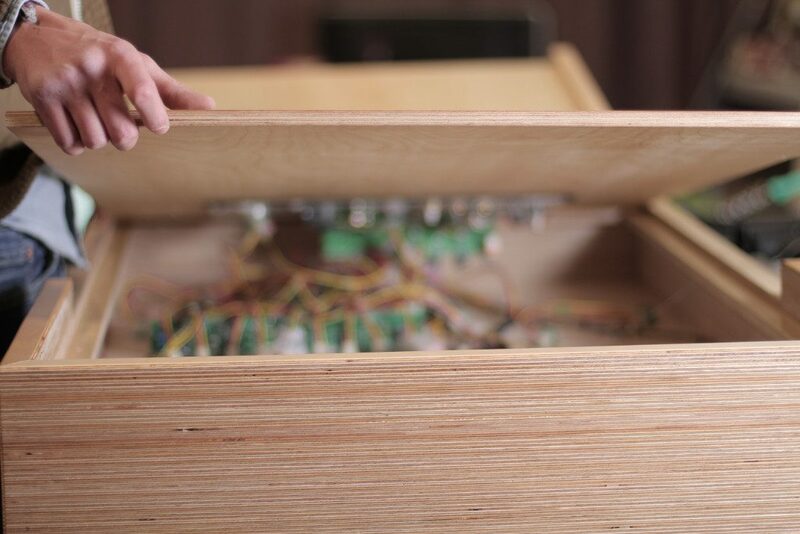 Therefore we had only 2 weeks to design the electronic circuits and graphic drawings, to receive all the components, to find a wood worker, to assemble every parts and to implement a few tests and make some adjustment ! Fortunately, we quickly managed to find a friend that did build the wooden panel for us. We intensively worked together during 1 week in order to build up the panel and the custom made flight case. Meanwhile, all the electronic circuits were designed and made. There was only one week left for the assembling and the testing work. It “separates” the sound into 4 frequency bands (Sub, Bass, Medium and Treble). Then one can then adjust the level of each band (to amplify or to attenuate each) or to totally mute it (Ligado, Desligado). The active filter section with lights, knobs and mute switches. 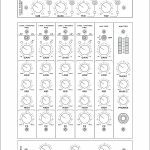 Every knob controls the amount of the modification applied to a particular frequency. Turning it clockwise will amplify this frequency, turning it anti-clockwise will attenuate it. 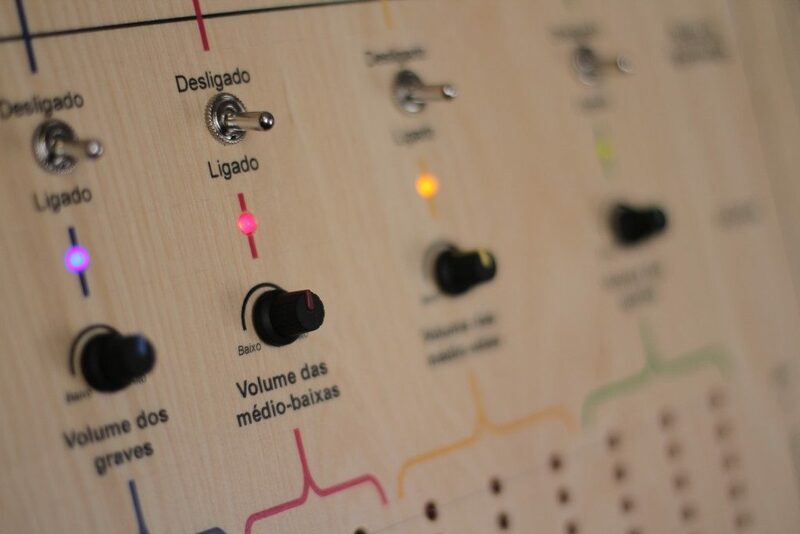 Each knob of the 10 has a column of LEDs that lights on or off according to the modification applied to the current frequency, which enables the user to visually see how the modification is applied. The dub siren is a very typical instrument used by reggae Sound systems. 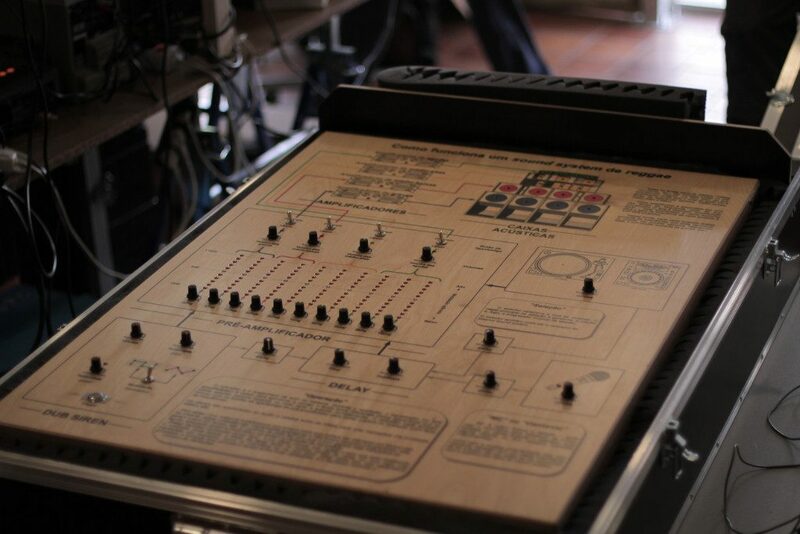 It is a pitch-modulated sound generator. 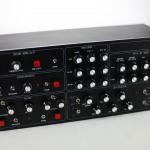 We decided to integrate this feature into our panel as this is a very commonly used effect in the reggae & dub scene. 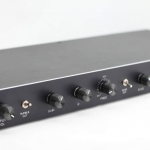 It is generally used in transitions between musics, one can change several parameters of the generated sound, and then trigger the sound by pushing the “Trigger” push button. For custom requests, please do not hesitate to contact us.